Highpoint on Gutbuster 8B+ in sunnier times in May 2017 - very very close but needed some more cold days! Thanks to Chris Prescott/Dark Sky Media for the pic. Oh man, thinking about it, it’s actually eleven years. In 2007 I was 29 and was climbing really well. In that period I did my first E11, my first 9a and was doing a lot of high standard climbing across the disciplines. I was living in Dumbarton and doing a ton of climbing there, but in May 2007 we made a plan to move to the highlands and so I did a bit of a mad rush for a few weeks to finish various remaining projects on the boulders. I climbed all of them except the hardest one - the link across the roof into the start of Sanction (Font 8B). I got really close at the time but it didn’t happen before I left. It seemed like madness to drive back from my new home in the highlands to finish it off so I was happy enough to forget about it. 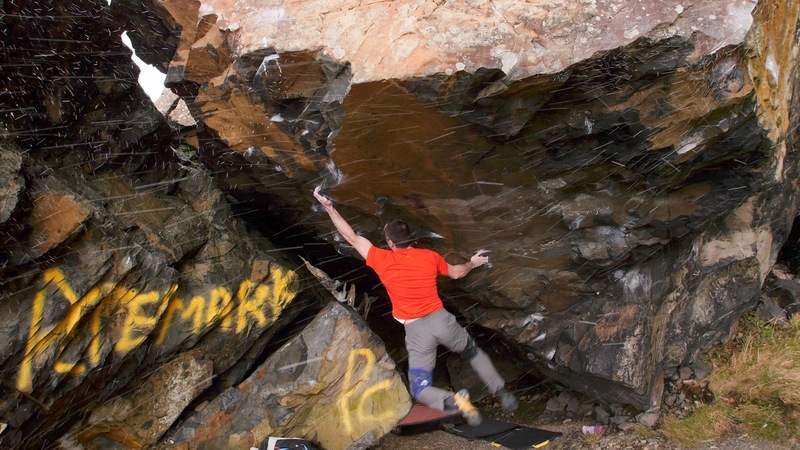 Although I did have kind of a niggle that it would have been nice to open an 8B+ boulder at Dumby. 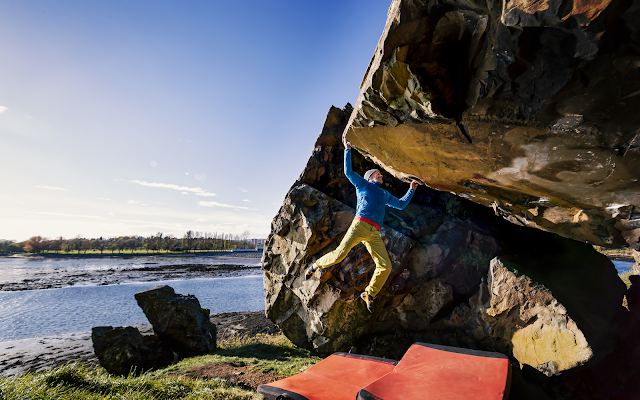 Thankfully Malcolm Smith sorted that out in 2008 and made the first ascent, calling it Gutbuster 8B+. The strenuous kneebar rest between the two halves of the climb certainly is a Gutbuster, but it’s pretty important to get as long as possible on it, to be fresh for the tricky jump move right at the end of Sanction. 8 years after its first ascent it is still unrepeated to my knowledge. Last spring I was going climbing in Arrochar but got rained off and since I’d driven down, I bailed to Dumby instead. I stood looking at Gutbuster again and decided to get on it and see if the moves felt harder for my ten years older body. I did actually feel a tiny bit stronger on it although obviously memory is not perfect! The curiosity switch was instantly flicked and I decided to see if I really could burn off my 30 year-old self ten years later. I had some sessions, but with it being May it was getting kind of late and although I got ridiculously close, I ran out of conditions. I also noted that I’d been doing lots of redpoints and lots of rest days and had lost fitness. I really needed to get some training in, but there wasn’t time with just a couple of weeks left of the hard bouldering season. So I left it and aimed to come back in September. But in September I had a separated shoulder and was battling just to raise my arm above my head, never mind climb anything. I managed to get back on Gutbuster by November while I was down studying at Glasgow Uni for a month. I was climbing but still not nearly on 8B+ form and my right arm was still extremely weak. Sometimes it can be good to work out the moves while weak and find the best method. 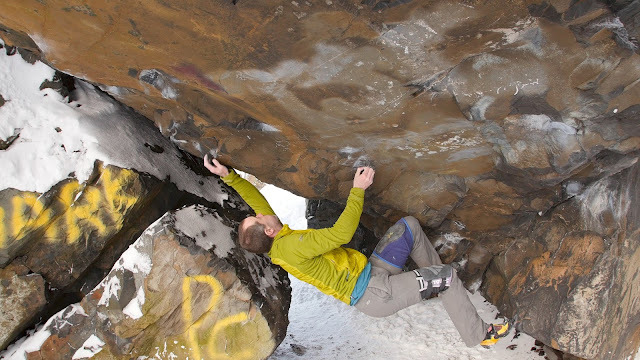 My plan was to build up my strength with a few sessions on it, get it wired and then go to Spain in Jan and try and get back towards 8B+ form. On top of that I had my usual experiments with various aspects of diet and recovery protocol. It worked really well. I had one session on it the other week in poor conditions and felt noticeably stronger, then another hard week of training on the board. I really wore myself down in that training stint and was exhausted every night, but hoped after a rest day I’d feel very strong right on time for a busy work period finishing and the good conditions starting. Then I went back down on Tuesday just before the worst of the recent snow arrived. It was snowing at the crag but seemed okay for climbing. I warmed up and tried a few moves and instantly knew I had a chance to send it that day, feeling by far the strongest I’ve ever felt on it. But on my first two tries my foot slipped at the same move halfway up Sanction. I tweaked the beta and it was much better. I also realised I wasn’t able to fully relax in the kneebar rest and spend a fair bit of time faffing with the kneepads to get them in the right spot on my thighs. That also made a huge difference and I could relax and get my breathing down at the rest. On the third try a full on blizzard started while I was on the shakeout. My hands went numb and I fell off Sanction, but even if I hadn’t, the top holds were full of snow and I’d never have made it through. I retreated to the cafe for a brew while the snow raged and then returned and brushed the snow off the holds. But it was getting dark and getting silly. Snowstorm started mid attempt. It wasn't going to happen. I had my ‘one last go’ and fell near the end of the first half when I couldn’t see a foothold in the gloom and slipped of it. Och well. Just to finish myself off, I went back to the start without even taking my rock shoes off and started again. This time I scrapped through the first roof but with the kneepads properly positioned and jumper on this time, I was warmer and much more relaxed and able to ‘shake off’ the stress of the first part. I took an extra moment to compose before taking the little spike crimp, for no particular reason, and started up Sanction. This time I just happened to make all the moves really error free and got to the jump. I was just that much stronger on it than previous sessions and next thing I’d done the crux and my eye level creeped over onto the top slab. I did feel powered out while setting up for the last tricky stab to a crimp, but held it nonetheless. At that point there only a real mess up would send me off and I found myself stood on the slab, wide eyed. Gutbuster finishes up Imposter arete, a straightforward 5a but really a solo with a horrendous fall if you did decide to come off it. Normally I’d just walk up it, but now most of the footholds were wet and holds were full of snow. It felt more like E4 5c, crimping the hell out of the damp snowy crimps. Getting off the boulder was even more of a gripper! The descent climb faced directly into the snow and was snow covered slippery death. So I guess I showed to myself that its possible to burn off your 30 year old self ten years later. Clearly I need to be cautious in how I interpret this. But I have to admit that I find it hard to doubt that the changes I’ve made in my approach to training have made a difference. Actually the training hasn’t changed that much, its more the lifestyle and especially nutrition practice. I do feel generally better, but specifically a bit stronger and more resilient to training stress, illness, injury. In other words, I feel like I bounce back a little better than I did before. I’ll keep testing, trying to falsify. If it keeps working in this direction, I’ll take it! I’ve read a ton of recent research in various corners of physiology over the past two and a half years. The details of this are rather complex and thee’s no doubt it’s like looking at a half-finished jigsaw puzzle of evidence. But I increasingly form a hunch that at least a decent proportion of the age-related decline in performance and/or increase in brokenness seen across sport could be prevented by deviating from some of the standard advice in sports science discourse. Doing this involves a bit of curiosity to use the evidence base as just that, a base, a starting place, from which to take some educated guesses and head off in search of new places for organised research to follow on behind. To me this has always been what sport science has been about. I'll post up some video of climbing it shortly. '...But I increasingly form a hunch that at least a decent proportion of the age-related decline in performance and/or increase in brokenness seen across sport could be prevented by deviating from some of the standard advice in sports science discourse' ...very interesting, Dave, bodies become more 'unique' as we get older, younger athletic bodies are of course more flexible and malleable in any direction?